Whether you can't eat eggs due to an allergy or choose not to for personal reasons, finding a substitute for them can be tricky. Fortunately, there are several foods that can take the place of eggs in cooking and baking. Some of them have protein structure comparable to eggs, whereas you'll need to adjust your recipe for others. Eggs are a good source of protein. A small egg has 4.6 g of protein, a medium egg has 5.5 g, and a large egg has 6.2 g, according to the Fat Secret food and nutrition database. 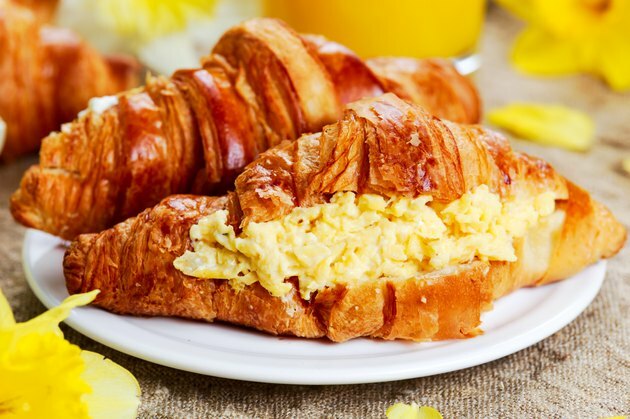 Unfortunately, eggs are also one of the top eight allergenic foods, according to the U.S. Food and Drug Administration. You can use firm tofu as a substitute for scrambled eggs. To do this, press the tofu until it is only slightly damp, crumble it with your fingers, and cook with your favorite seasonings. Sprinkle on some turmeric while cooking to provide a nice yellow color. You can find good scrambled tofu recipes on vegetarian-focused websites and in vegan cookbooks. Three ounces of firm tofu provides 12 g of protein, twice the protein in a large egg, according the Calorie King nutrient database. Silken tofu is a softer, more pliable tofu product. It is good for adding protein to soups and puddings. You can also use it for baking. Isa Chandra Moskawitz, author of the cookbook Vegan with a Vengeance and founder of the Post Punk Kitchen website recommends using a quarter cup of silken tofu for every egg called for in a dense recipe such as brownies, and using one tofu "egg" for every three eggs called for by lighter recipes, such fluffy cakes. One ounce of soft silken tofu contains 1.36 g of protein, according to Fat Secret. If you can't consume soy products, or simply don't chose to, ground flax seeds work as an egg replacer in cooking and baking. Moskawitz reports that you can use one tablespoon flax seeds—measure before grinding—mixed with three tablespoons of water to replace one egg. This substitution works best in finished products that are supposed to have an earthly taste, such as pancakes and nut-based cookies. The flax seeds contain 2 g protein, about half of the protein of a small egg, but protein content is often not the primary concern in baking. Egg replacer is a starch mix sold at health food stores. According to Moskawitz, 1 1/2 tablespoons + 2 tbsp water mixed well = 1 egg. Be aware that while Moskawitz finds egg replacer chalky, she also reports that some vegan bakers swear by it. Be aware, however, that commercial egg replacer does not contain protein, so if you're baking with it, make sure to get your protein somewhere else. Does Scrambling an Egg Ruin the Protein?